What is it like to grow up in one of the most notorious slums in Rio? The immediate goal of a seven-year-old homeless boy in this city is not finding a family or a friend, but finding a gun. Violence is the very essence of life and a passport to adulthood. "I smoke, I snort, I kill, I’m a man," says one of characters. Director Fernando Meirelles takes the viewer into this weird, psychotic world, euphemistically called City of God. 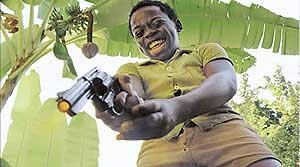 There’s Li’l Ze (Leandro Fermino), formerly Li’l Dice, the City of God’s most notorious gang leader. But he isn’t clever enough to make the big time in upper crime circles. Opposed to him is Knockout Ned, a man who commands respect for his decency rather than his criminality. Then there’s Buscape or Rocket (Alexandre Rodrigues), as he is known to the gang, too frail and scared to become an outlaw but also too smart to be content with underpaid, menial jobs. So he ends up becoming a photographer and more importantly the narrator of the film. And what a narrative it is. Aided by a powerful screenplay by Braulioa Mantovani and based on a novel by Paulo Lins, City of God is about actual events that occurred in Rio de Janeiro during the 1960s and 1970s and the roles are played by the adolescents living in the slums of the city today. Like Pulp Fiction the film begins in the middle with Rocket being accosted by the cops. It cuts then to the 1960s where the disparate characters that people this starkly dehumanising drama are brought graphically to life. Mirelles’ style is ripe with fast cuts, hand-held camera sequences and other instances of visual potency reminiscent of Tom Tykwer’s Run Lola Run. There are different chapters and a plethora of characters flitting in and out of the frame like moths. Some stay briefly, others for long. There’s the Tender Trio and Shaggy and Goose. Suddenly one of the gang becomes religious but its members make no bones about handling the ‘real stuff’ — narcotics. "A hood doesn’t stop, a hood takes a break," they snap like adults. They also kill without compunction. They are called runts, kids who do not respect the law. And what a chequered path their escapades trace. Their slum is a purgatory most of the time but then there are moments when it is pure hell. Most of the violence is off-screen but that doesn’t mean it’s Sunday-school stuff. The scene in which a kid is brazenly shot in the foot is just one example. There’s more, much more, but the action is adequately buttressed by doses of sparkling, off-beat humour like the scene in which Li’l Ze tries to become a thief but quits because his victims were "too cool" to steal from. The acting is amazingly natural and one hardly feels one is seeing a story being re-enacted. If Leandro Fermino and Mans Galinha are expectedly effusive they have in Alexandre Rodrigues an ideal foil. Matheus Nachtergaele’s Carrot is unforgettable and Phillipe Haagensen’s Benny not far behind. They are all naturals and give the film its most realistic moments. Kudos to Fernando Meirelles for putting together this stunning, pulse-pounding piece of cinema. For connoisseurs of cinema City of God is a ‘godly’ experience. Don’t miss it.